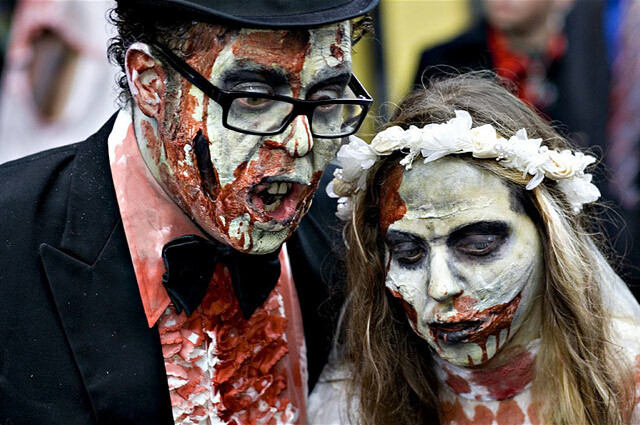 ZOMBIES: Put on your make-up and rip off your clothes—it’s the 2008 Toronto Zombie Walk! Sponsored by the concurrent Toronto After Dark Film Festival, the walk will stumble out of Trinity-Bellwoods Park, shuffle along Queen Street to Bathurst Street, and heave up to Bloor Street, finishing in the alley behind the Bloor Cinema. Zombies will receive a discount for tonight’s festival screenings. Brain-eating mayhem continues at the Annex Wreckroom for the Zombie Walk Afterparty, featuring Misfits tribute band The Skulls, with guests The Rock Ons and The Von Drats. (No cover, but donations toward next year’s street permit gratefully accepted.) Zombie participants should meet in the pit of despair at the Dundas Street end of the park. Trinity-Bellwoods Park, 3 p.m., FREE. PARADE: If eating brains isn’t your style, why not dress in blue and help celebrate the memory of the former Garrison Creek [PDF]? Human River’s Urban Water Cycle will recreate the river using blue-clad participants on bicycles following the original creek bed through the heart of the city’s west end to the garrison of Fort York, where there will be refreshments provided. The path runs through Trinity-Bellwoods Park, but organizers promise that will happen prior to the Zombie uprising. Northwest corner of St. Clair & Humewood, 1 p.m., FREE. MARATHON: Yet another reason to leave the car home today is the massive Toronto Marathon. The full run starts at Mel Lastman Square at 9 a.m. sharp and winds through the city to finish at Queen’s Park. More than five thousand people are expected to compete in the half marathon this year, and another two thousand will be running the shorter five kilometre run. Funds raised go to the Princess Margaret Hospital. Yonge Street, Queen’s Quay, Lakeshore Boulevard, and University Avenue [PDF], 8 a.m.–1 p.m., FREE to cheer on participants. FAIR: Not sure what to be for Halloween? The Royal Sarcophagus Society, a local design collective of the uncommon, is holding its first ever Bazaar Of The Bizarre today. The event is a Halloween marketplace full of clothing, small press, hand crafts, and other goodies. 6 Noble Street, 11 a.m.–6 p.m., FREE. PARKS: Finalists in the June Callwood Park design competition will be on display today at Fort York, with Deputy Mayor Joe Pantalone attending at 1 p.m. The future park will run between Fort York Boulevard and Fleet Street, just south of the fort. Watch out for blue-clad cyclists arriving if you are there after 3 p.m. Fort York, Blue Barracks, 100 Garrison Road, 10 a.m.–3 p.m., FREE. Photo by Gabe Toth from the Torontoist Flickr Pool.